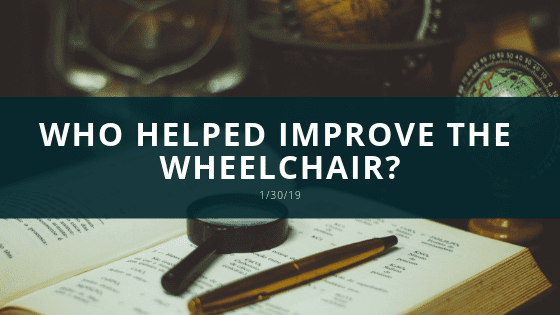 Who Helped Improve the Wheelchair? There have been many people who have helped make the wheelchair what it is today. Throughout history, the purpose of the wheelchairs has changed slightly to improve the needs of people. The first recorded wheelchair was engraved on an ancient Chinese stone but uncertain of the inventor. However, the first dedicated wheelchair known as the invalid chair was created for King Phillip II. The inventor is not known and yet it is known its main purpose was to help King Phillip II move around in his kingdom. Sixty years later a self-propelled wheelchair was created by a watchmaker names Stephen Farfler. This was a great thing because it allowed the person in need of mobility become slightly more. In 1783 John Dawson created a wheelchair similar to the one created by Farfler yet it had two larger wheels and a small one in front. In the 1800s the Bath Wheelchair was not as comfortable and new inventors began adding a feature to in order to help improve it. However, these inventors are unknown but some of the improvements include better wheels that were hollow like those on bicycles and footrest that adjusted to help provide better comfort. In the 1900s the folding chair was invented by Harry Jennings for a friend named Herbert Everest. They then created Everest & Jennings a company that would monopolize the wheelchair industry for years until an antitrust suit was filed. The next inventor that made a significant change to the wheelchair was George Klein. He was the inventor that create the electrical wheelchair that did not have to be propelled by anyone else or even the user. John Donoghue and Braingate created the most recent innovating technology of the wheelchair that allows the users with limited mobility to connect with the wheelchair through a monitor connected to their brain where they can send mental commands to the wheelchair making it do what they want it to do. There have been many more people who contributed to the development of the wheelchair to be where it is today. Not mentioned in this article wheelchairs have been developed to allow those without the capability to use their legs do sports, use outdoors, indoor, and overall facilitate those users needs. There is a wide range of wheelchair options and styles for specific purposes. Technology has also allowed inventors to develop special wheels and features that can impact the performance of the wheelchair. This entry was posted in Time Machine, Wheelchair News. Bookmark the permalink. What Do You Do When Life is Difficult Sometimes?